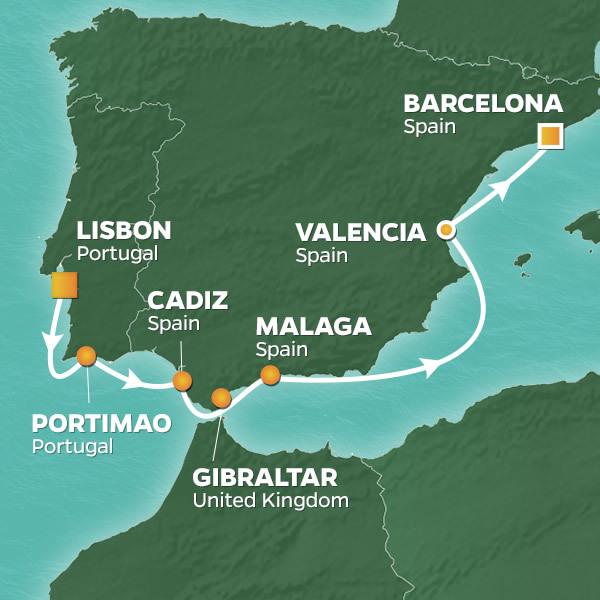 PerryGolf proudly partners with Azamara Club Cruises for an exceptional 8 night, 5 round voyage onboard the outstanding 690-guest Azamara Pursuit around the Iberian Peninsula. We begin in Lisbon with five captivating ports of call ahead including Barcelona for an overnight plus Gibraltar, Valencia, Malaga and Cadiz. The golf is outstanding, taking us to 1997 Ryder Cup venue Valderrama, the beautiful Finca Cortesin and the Faldo Amendoeira in the scenic Algarve region ... Read More. In Portimao, enjoy golden sandy beaches under dramatic cliffs and taste the freshest sea bass, lightly drizzled in olive oil and grilled to perfection. Stroll the tiny cobblestone streets of Cadiz, while admiring the Moorish architecture in Europe’s oldest most continually inhabited city. Watch the Barbary apes frolic at the Rock of Gibraltar, Tour the 11th century citadel Alcazaba in Málaga, which is the capital of Costa del Sol. Old World charm meets modern architectural genius in Valencia, which is Spain’s third-largest city. We conclude in Barcelona, a popular destination for travelers from across the globe because of its abundant food, wine, beaches and architecture. We’ll enjoy a diverse, challenging and entertaining golf program. Valderrama is a regular stop on the European Tour and routinely considered the No. 1 course in Continental Europe, drawing comparisons to Augusta National, home of the Masters. Finca Cortesin receives similar praise, as it may be the masterpiece of the underrated yet prolific architect Cabell B. Robinson. The Faldo Course at Amendoeira Golf Resort, designed by the six-time major champion Sir Nick Faldo, is set on an undulating property and offers the ideal mix of beauty and strategic challenge. El Saler is a classic layout on the outskirts of Valencia and El Prat is an excellent Greg Norman design in Barcelona. The guest list will number between 40 and 60, most of whom are golf couples. It’s also common to have non-golfers who will enjoy themselves as a luxury cruise guest starting with Azamara Pursuit’s fabulous facilities combined with a wide selection of Azamara Shore Excursions®. The “2020 Iberian Peninsula Golf Cruise” is a full-featured vacation and a unique opportunity to enjoy yourself in the company of like-minded new friends! Embark Azamara Pursuit beginning at 1:00PM. All aboard by 4:30PM. GOLF: The Faldo Course at Amendoeira Golf Resort, designed by Sir Nick Faldo, opened for play in 2008. In a modern twist of a traditional recipe, cacti and wild herbs replace the role of Sunningdale’s heather, and spartan holm oaks and ancient olive trees take the place of a lush English woodland, and desert scrub bunkers of crushed limestone replace Berkshire’s sandy tracts in a golf course that revels in the classic principles of strategic play. It also enjoys great views, in particular on the back nine. SIGHTSEEING: Portimão is located in the District of Faro in the Algarve Region of Portugal, and is the host venue for many prestigious sailing events. The Lisbon to Dakar Rally passes through, and there is also surfing and kitesurfing. This is a great place for seafood restaurants with grilled sardines being the specialty. Enjoy Portimão on your own or via Azamara Shore Excursions®. Cádiz dates over 3,000 years, is considered “the oldest continuously inhabited settlement in Europe”, and is perched on a narrow strip of land surrounded by brilliant blue waters. Stroll through the barrios and narrow alleyways of the Old Town, with stops along Plaza San Antonio, Plaza de Mina, and Plaza de la Catedral, where you can see one of the city’s most famous landmarks, the Cádiz Cathedral. In the El Pópulo district, you’ll find the second largest Roman theater in the world (which was constructed in 1st century BC), go to Tarifa for beautiful beaches, a variety of watersports, and great views of Morocco, or simply enjoy a traditional meal of Andalusian specialties like gazpacho, fried fish, Iberian ham, and a glass of Jerez sherry. Enjoy Cadiz on your own or via Azamara Shore Excursions®. GOLF: Valderrama is a perennial World 100 layout consistently been rated among the five best in Continental Europe. “The Augusta of Europe” is a private club originally designed in 1974 by Robert Trent Jones on a hill above the old Andalucian village of Sotogrande. He was recalled in 1985 for a remake that has subsequently hosted a plethora of championships including the Volvo Masters and the 1997 Ryder Cup remembered for Europe’s late, great and charismatic captain Severiano Ballesteros. SIGHTSEEING: The Rock of Gibraltar is a sight to behold rising nearly 1,400 feet out of nowhere located in a strategic position at the southern end of the Iberian Peninsula. It overlooks the Straits of Gibraltar and is linked to Spain by a narrow isthmus. Most of the upper Rock, starting just above the town, is a nature reserve with spectacular views accessible by cable car. Gibraltar is imposing but small. It measures less than six square kilometres and is inhabited by around 30,000 people made up of Gibraltarians, British, Moroccans, Indians and Spanish. There is a colony of the famous, camera-hogging Barbary apes who run free in a semi-wild state. Gibraltar is a British self-governing colony and a member of the European Union by virtue of Britain's membership. Enjoy Gibraltar on your own or via Azamara Shore Excursions®. GOLF: Finca Cortesin is ranked as one of Spain’s finest golf courses by Golf Digest Magazine. Cabell B. Robinson’s design beautifully complements the natural landscape. It provides a perfect balance between 20 varieties of flora, the typical Mediterranean forest and the perfectly manicured bermuda grasses of the golf course. Finca Cortesin played host to the prestigious Volvo World Match Play Championship for 3 years, with many of the world’s finest professional competing. SIGHTSEEING: Malaga is found on Spain’s famous Costa del Sol along with its coastal and inland neighbors Rincon de la Victoria, Torremolinos, Benalmadena, Fuengirola, Alhaurin de la Torre, Mijas and Marbella. The important cultural infrastructure and the rich artistic heritage have culminated in the nomination of Malaga as a candidate for the 2016 European Capital of Culture. The internationally acclaimed painter and sculptor Pablo Picasso and actor Antonio Banderas were both born in Malaga. Enjoy Malaga on your own or via Azamara Shore Excursions®. Valencia has come a very long way since 138 BC when it was founded as a Roman colony. Today it is Spain’s third largest city after Madrid and Barcelona. It has one of the world’s most prosperous local economies. The story you’ll probably take home however is about one of the most striking ranges of architecture imaginable. Of course you’ll find antiquity in many forms such as Valencia’s Gothic cathedral which was built over a mosque after the Christian reconquest of 1238. You will also find the space-age City of Arts and Sciences, a massive project by neofuturistic architect Santiago Calatrava (World Trade Center Transportation Hub) whose showpiece is Oceanogràfic – one of the world’s biggest aquariums, with polar zones, underwater tunnels and an underwater restaurant. The juxtaposition is startling. And you’ll have two full days to immerse yourself in it! GOLF: El Saler is located on the outskirts of Valencia within the Albufera Nature Park. Designed by Javier Arana, one of the most prestigious Spanish designers and opened in 1968, it sits nearby the beach occupying terrain dotted with pine trees and sand dunes and has a distinctly “links” feel. It’s famous "cats claw" (not dissimilar to the Monterey Peninsula’s “iceplant”) is certainly to be avoided in the rough. GOLF: Real Club de Golf El Prat is located to the north of Barcelona at Terassa. It was the first golf course in continental Europe to be designed by Greg Norman to give it a unique character that places an emphasis both on aesthetic appeal and playability. Norman's designs have traditionally given the impression they have been part of the landscape for generations. SIGHTSEEING: Barcelona is the 11th most visited city in the world according to MasterCard’s 2014 Global Destinations Index and 3rd most popular in Europe behind London and Paris. There’s a lot to like in this Olympic City (1992) from the food to the beaches, the weather and the night life. For many visitors however Barcelona is about architecture, especially the work of Antoni Gaudi. His Sagrada Familia in the city center is astounding. Construction began on the church in 1882; it is scheduled for completion in 2026 on the 100th anniversary of Gaudi's death. Azamara ships will almost always dock at the foot of Las Ramblas just steps from the Christopher Columbus statue. You will literally walk off the ship and into the city. No taxi required! Enjoy Barcelona on your own or via Azamara Shore Excursions®. The Faldo Course at Amendoeira Golf Resort, designed by Sir Nick Faldo, opened for play in 2008. In a modern twist of a traditional recipe, cacti and wild herbs replace the role of Sunningdale’s heather, and spartan holm oaks and ancient olive trees take the place of a lush English woodland, and desert scrub bunkers of crushed limestone replace Berkshire’s sandy tracts in a golf course that revels in the classic principles of strategic play. It also enjoys great views, in particular on the back nine. Valderrama is a perennial top 100 layout in the World consistently been rated among the five best in Continental Europe. “The Augusta of Europe” is a private club originally designed in 1974 by Robert Trent Jones on a hill above the old Andalucian village of Sotogrande. He was recalled in 1985 for a remake that has subsequently hosted a plethora of championships including the Volvo Masters and the 1997 Ryder Cup remembered for Europe’s late, great and charismatic captain Severiano Ballesteros. Finca Cortesin is consistently ranked as one of Spain’s top five golf courses. Cabell B. Robinson’s design beautifully complements the natural landscape. It provides a perfect balance between 20 varieties of flora, the typical Mediterranean forest and the perfectly manicured bermuda grasses of the golf course. Finca Cortesin played host to the prestigious Volvo World Match Play Championship for 3 years, with many of the world’s finest professionals competing. Real Club de Golf El Prat is located to the north of Barcelona at Terassa. It was the first golf course in continental Europe to be designed by Greg Norman to give it a unique character that places an emphasis both on aesthetic appeal and playability. Norman's designs have traditionally given the impression they have been part of the landscape for generations. The Oceanico Faldo Course at Amendoeira, designed by Sir Nick Faldo, opened for play in 2008. In a modern twist of a traditional recipe, cacti and wild herbs replace the role of Sunningdale’s heather, and spartan holm oaks and ancient olive trees take the place of a lush English woodland, and desert scrub bunkers of crushed limestone replace Berkshire’s sandy tracts in a golf course that revels in the classic principles of strategic play. It also enjoys great views, in particular on the back nine. El Saler is located on the outskirts of Valencia within the Albufera Nature Park. Designed by Javier Arana, one of the most prestigious Spanish designers and opened in 1968, it sits nearby the beach occupying terrain dotted with pine trees and sand dunes and has a distinctly “links” feel. It’s famous 'cats claw' (not dissimilar to the Monterey Peninsula’s “iceplant”) is certainly to be avoided in the rough.